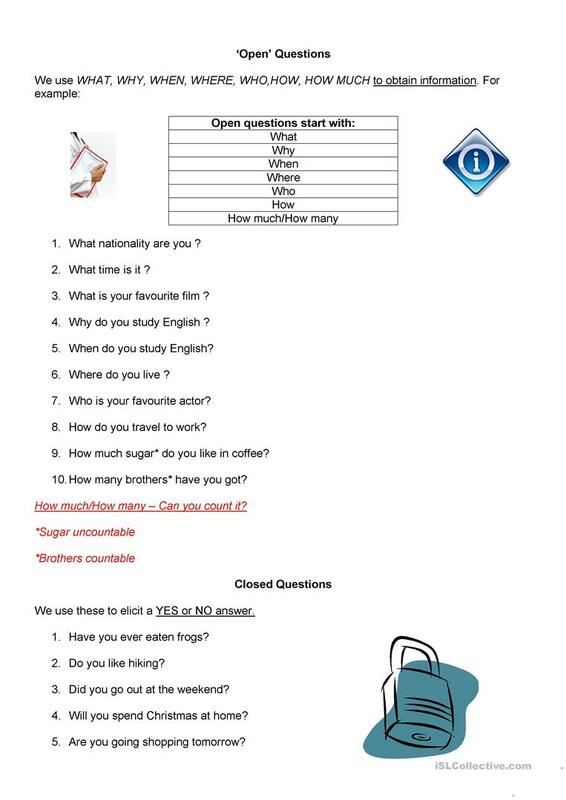 A handout showing the difference between 'open' information seeking questions and 'closed' questions which only require a one word answer. Can be used as a role-play to ask and answer questions with a parner. The above downloadable handout was created for business/professional students, high school students and adults at Pre-intermediate (A2) and Intermediate (B1) level. It is aimed at consolidating Questions in English, and was designed for improving your students' Listening, Speaking and Reading skills. It is about the theme of People. MegtheBlonde is from/lives in United Kingdom and has been a member of iSLCollective since 2010-11-30 17:56:34. MegtheBlonde last logged in on 2019-04-15 12:03:07, and has shared 1 resources on iSLCollective so far.